Heiteren is a village 5 kilometres south of Neuf-Brisach on the D468 road, which runs roughly parallel to the Franco-German border from Strasbourg to Basel in Switzerland. 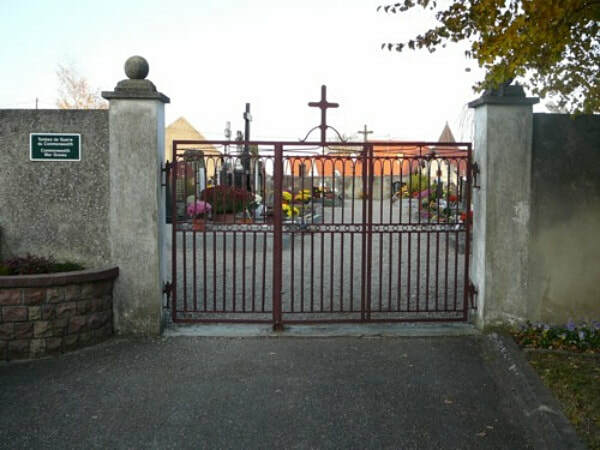 The communal cemetery is on the eastern side of the village, about 100 metres from the church and opposite the school. Near the middle of the eastern wall are the graves of 5 British airmen. 162805 Pilot Officer James Lever Atherton, Navigator in 166 Squadron, Royal Air Force Volunteer Reserve, died 28th April 1944, aged 32. Son of Stanley and Mary L. Atherton; husband of Florence Enid Atherton, of South Croydon, Surrey. INSCRIPTION. ALWAYS REMEMBERED BY KATHLEEN AND ENID. 1610917 Sergeant James Arthur Buncher, Wireless Operator in 166 Squadron, Royal Air Force Volunteer Reserve, died 28th April 1944, aged 21. Son of James Gilbert Buncher, and of Emily Buncher, of Sydenham, London. INSCRIPTION. OUR LOSS IS GREAT BUT WE HOPE IN HEAVEN TO MEET AGAIN THE ONE WE LOVED SO DEAR. 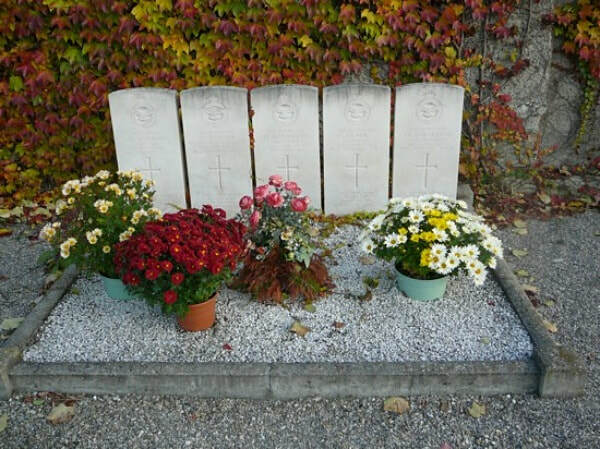 575689 Sergeant John Alfred Hargreaves, Flight Engineer in 166 Squadron, Royal Air Force, died 28th April 1944, aged 20. Son of John and Jessie Hargreaves, of Salford, Lancashire. INSCRIPTION. GREATER LOVE HATH NO MAN THAN THIS". 1312291 Sergeant John James Opie, Air Gunner in 166 Squadron, Royal Air Force Volunteer Reserve, died 28th April 1944, aged 21. Son of Charles Opie and of Celia Opie (nee Stone); nephew of Mr. J. R. Opie, of Helston, Cornwall. INSCRIPTION. A LOVING SON, ONLY LENT, ONE OF THE BEST GOD EVER SENT. 605522 Sergeant John Fenwick Weatherell, Air Gunner in 166 Squadron, Royal Air Force Volunteer Reserve, died 28th April 1944. Son of Thomas H. Weatherell, and of Nancy E. Weatherell, of New York City, U.S.A.